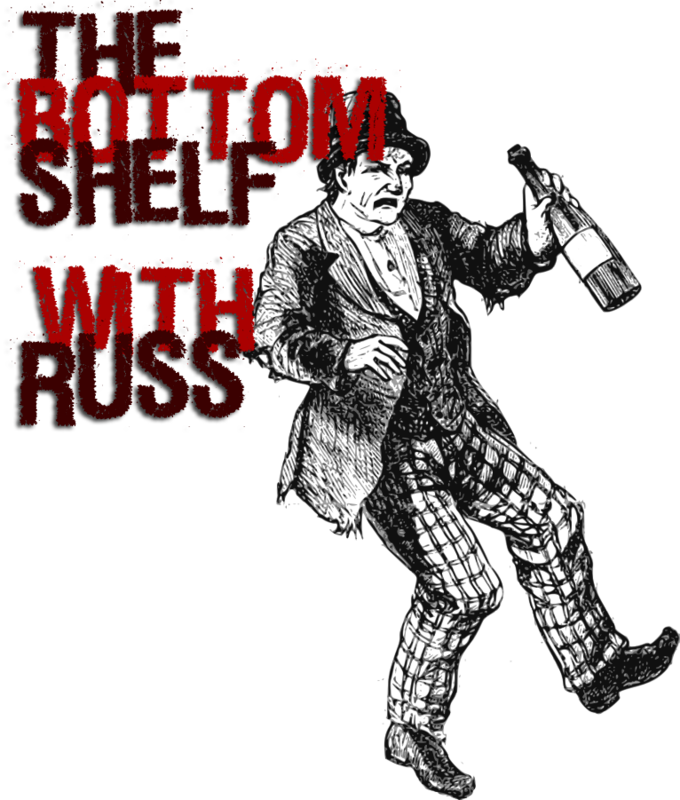 Welcome back to The Bottom Shelf with Russ! 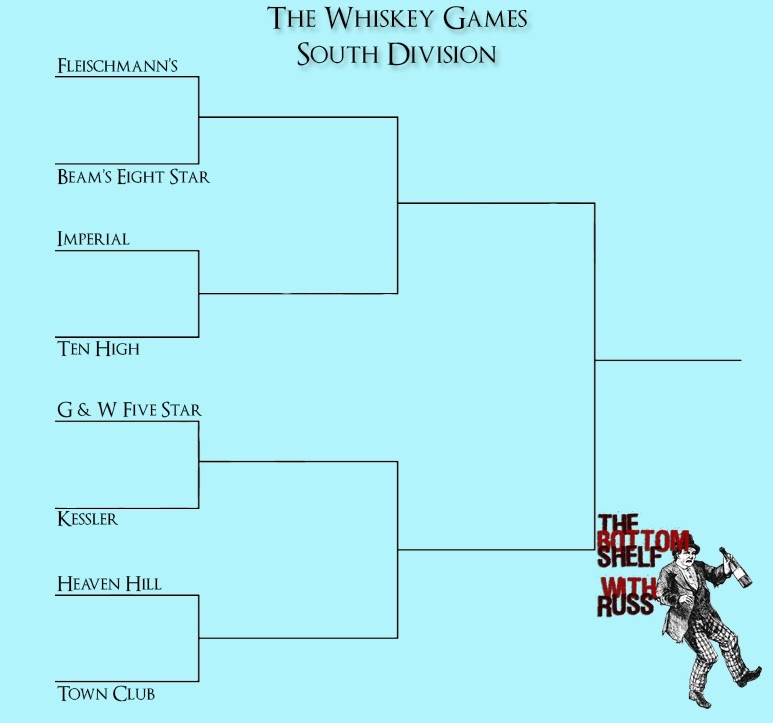 In keeping with the theme of March Madness, cheapo whiskey will square off in it's own bracket tournament: The Whiskey Games. Let's get ready to stuuuummmmbble! Bottom shelf whiskeys will battle each other for the title of worst whiskey ever. The competition will be strong, as all previously reviewed whiskeys, plus two unknowns, will be featured in this showdown. 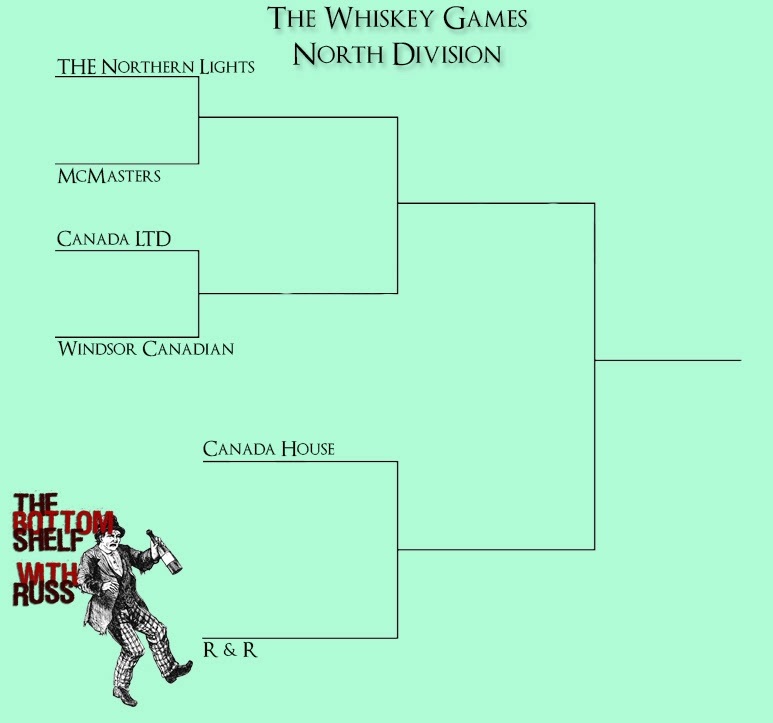 All whiskeys will be put into brackets and seeded somewhat according to earlier reviews There will be a North and South division The competition should be fierce, as all participants have stellar histories and low brow genealogies. Gag factors will be high and there will be bum slush parties in every alley and dead end road. Previous reviews are not to be a factor other then to help set up pairings. Just think of the new rivalries! This will all lead up to the war of whiskey and the battle of barf. In the South division, where you can divorce your wife and she can still be your sister, the number one seed is the reigning king of dry heaves: Fleischmann's Preferred, the putrid poisoner. Next are Beam's Eight Star, Imperial Whiskey, Ten High (Toto the drunken clown's fav. ), G & W Five Star, Kessler(smooth as silk), Heaven Hill, and the unknown newbie, Town Club. Town Club is bottled in St. Louis, Mi. What a line up in the south. In the North division the creme de la crap is Canada (out) House in the top spot, followed by Canadian LTD, Windsor Canadian, THE Northern Lights, R & R whiskey, and McMasters, a dark horse (smells like one too) from Canada. In the North, Canada House and R & R have a first round bye. Don't ask why, just go with it. All the combatants have reputations of one sort or another. Many questions will be answered when they tangle with each other. Will Fleischmann's skunk the others? Or can Ten High or Canada (out)House take bum slush to the next level? Maybe your favorite is G & W Five Star or Beam's Eight Star. Coming soon: Bottom Shelf Whiskey Fever. Find out who is the true Victor of Vomit. The Bottom Shelf stoops to new lows in it quest for the worst! Want to get in on the action without embarking on the same painful and nearly life ending journey? You can win an Amazon Gift Card equivalent to the cost of the "winning" bottle of whiskey! All you need to do is send us an email to Contests@PBandAwesome.com with your tournament picks (just like with that big college basketball tournament), name, address, and date of birth. If you are the only one to pick a perfect bracket, you will win! If there is a tie, the winner will randomly be selected. Entries will be accepted until March 21, 2014. This contest is only open to legal U.S. residents only. The winner will be announced soon after the final results are posted.